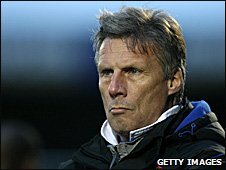 Former Carlisle boss John Ward has held preliminary talks with Bill Bratt about becoming the next Port Vale manager. "John is interested, but we need to go into a lot more detail regarding what his ideas are for the club," the Vale chairman told BBC Radio Stoke. "We'll see what comes of that, but there are six or seven other people that we want to set our sights on." Vale are looking for a successor to Dean Glover, who was relieved of his duties after seven months in charge. Glover could remain at the club as part of the youth setup at Vale Park, and he has held meetings with Bratt about staying. "He hasn't decided yet, but he's got to think about things," the Valiants chairman said. "He's got a family to consider, and if he feels like he wants a break, that's entirely up to him. The decision is his." Bratt and the rest of the Vale board are hoping to finish compiling their shortlist for the job on Wednesday and start the interview process by the end of the week.